Discussion in 'Australian Lizards and Monitors' started by Callopistes, Jun 8, 2009. I had a couple of King's Skinks do that. Had their basking light on all morning and yet they didn't emerge from their hides, so I switched off the light. Fast forward to after eleven at night when I was preparing to go to bed and there they were, both on the basking rock, waiting for the "sun" to come out. Perhaps I should install a clock for them? Haha. Harry is usually one to sleep in until 10 or 11, so this is really odd for him. I think maybe he isn’t ready to brumate just yet or something! Not a very good pic but these are hard to get pics of. WA banded scalaris. Neil j, richyboa72, HSVGTP and 3 others like this. Thanks bushfire. I couldn't be happier with them. As Darryl Kerrigan would say " there going straight to the pool room "
Stompsy, MANNING and Bushfire like this. Picked my little Spencer’s today, he’s settling in well. Foozil, dragonlover1, jasonicBlast and 5 others like this. Enki having a wander around my bedroom this morning while I tidied up. Such a curious dude. George excited for food and George realising there was no food. dragonlover1, Nero Egernia, Smittiferous and 4 others like this. Took this cute pic today haha. Does anyone reckon he's a bit fat? I've cut him back to being fed two times a week now instead of every second day. dragonlover1 and Stompsy like this. Doesn't look fat to me. It's not the best angle to tell though. Well either way. He'd fed well enough cause' I can pretty much do whatever I like and he doesn't give a crap. Scratch his chin, pat his head, or body, tail. Unless he's just really lazy. : P.
George is like that but it’s not cos she’s lazy, just very tolerant. She’s great. You can slide open the door and she climbs up your arm onto your shoulder. I’m going to take her home with me one day... or swap her out with Harry. Foozil, dragonlover1, Scutellatus and 5 others like this. My George. Get your own. Foozil, dragonlover1, Richard Biffin and 4 others like this. Looks familiar Going well for you, I hope mate? Love the name btw, now I'll have to think of another one, Lol. Stompsy and Smittiferous like this. So the globe I had in Turoks enclosure blew and I figured while I was at it I might as well up his wattage a little since it is getting colder. However at the time all that was available in the next wattage up was frosted/pearl, as opposed to clear (what I normally get). Is there much difference between the two? Any negatives to the frosted globes? It does seem to illuminate light more evenly and temps still get to the desired range. Was more just wondering. You're only after heat so it shouldn't be a problem. I can't access the video @dragonlover1. It is a closed group it appears. Bl69aze, MANNING and Stompsy like this. Flaviemys purvisi and Stompsy like this. My contribution to my favorite thread here so far. Here is my 8 month old ackie at 170 grams and 48 cm long. 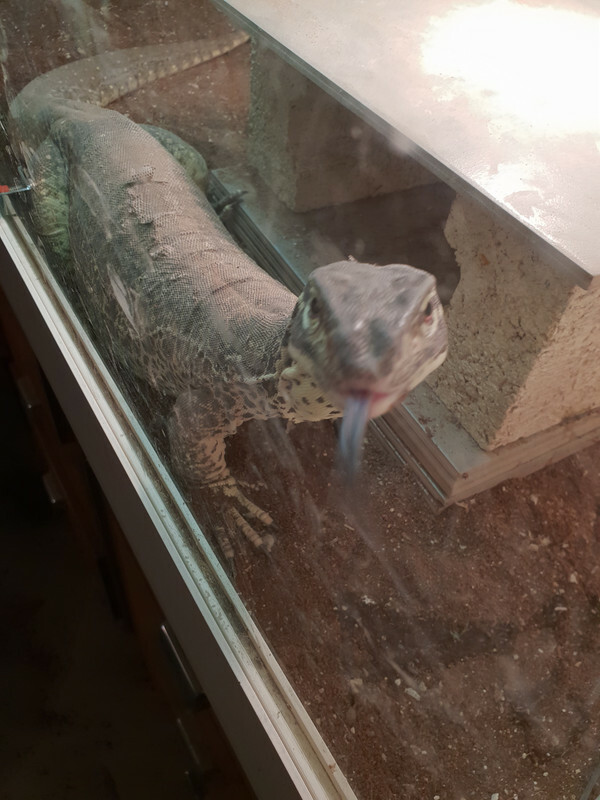 He won my wife over to reptiles with his personality. I am progress of building his final enclosure at 2m long x 1m wide x 1.5m tall. Foozil, Murph_BTK and Stompsy like this.